With a razor-sharp edge, this 8-inch chef's knife works great for chopping, dicing, and slicing. The knife features a Friodur ice-hardened blade precision-forged from a single piece of high-carbon stainless steel and crafted to hold its edge for a long time. In addition, the chef's knife enhanced bolster and full-tang design makes for a stronger, more balanced knife, while its ergonomic polypropylene handle provides maximum comfort. The detail of the new stainless-steel cap on the end of the handle with the Twin logo stamp provides an update to a Henckels classic. For best results, wash the knife by hand using a mild cleanser and dry completely. Made in Germany, the 8-inch chef's knife measures approximately 12-3/4 by 3/4 by 1-1/4 inches and carries a limited lifetime warranty. J.A. Henckels is proud to celebrate its 275th anniversary with its newest knife line--Twin Four Star II. This new line represents the rebirth of a legend, the classic Four Star series, which was first introduced in 1976. Twin Four Star II knives have an improved weight and balance, as well as a host of other features, making them ideal for both home and professional chefs. The Four Star II line contains knives for all tasks, including the following open stock knife types: parer, bread, boning knife, kudamono parer, sandwich, fillet, carver, chef’s, slicer, santoku, and others. Twin Four Star II knives are also available in a range of block sets and gift sets, to be sure that your cutlery needs are covered. Twin Four Star II knives are precision forged from a single piece of exclusive-formula, high-carbon, no-stain steel under the all-new Sigmaforge standard. As a result, Twin Four Star II knives have improved quality consistency, lasting sharpness, and perfect geometry. 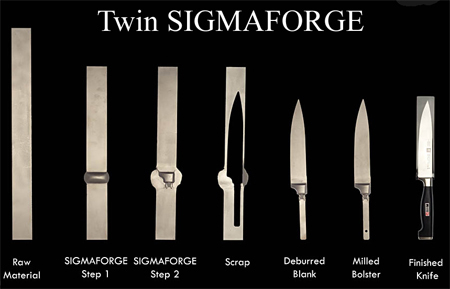 Sigmaforge one-piece construction also provides high precision and improved stability of the blade and steel structure, thus improving cutting-edge retention for lasting sharpness. In addition, Twin Four Star II knives use J.A. Henckels's Friodur ice hardening for corrosion resistance, a process that also contributes to cutting-edge retention. Twin Four Star II knives have an enhanced handle design that features a stainless-steel end cap with the famous Zwilling J.A. Henckels logo. These high-impact polypropylene handles are permanently bonded to the knife blades without any gaps. The new series also features improved weight and balance for improved cutting performance. Full rat-tail tang: Provides proper balance and greater strength. High-carbon, no-stain steel, an exclusive J.A. Henckels formula: Nonstaining, nonrusting. Hand honed: Is sharper and stays sharper longer. Polypropylene handles with stainless-steel logo cap on handle: Bonded with seamless accuracy, these comfortably molded handles are hygienic (autoclavable) and food-safe.